My LYS got a shipment of Mini Mochi not too long ago, which means it's probably been months omg it was way back in January. I always think they're so pretty, but I never know what to do with them. Because of that, I tend to pass on the yarn. I love self striping yarn for vanilla socks, but that's about the extent of my liking for patterns in yarn. I'm sure people have knit socks out of Mini Mochi, but it just doesn't seem like a very durable yarn where socks are concerned. I tend to prefer the semi solids and heathers mostly, followed by good ol' regular solids. My fun and crazy yarn is almost always reserved for socks. I feel like I can have a little fun, and keep it from being out there in everyone's face. I'm like a closet crazy-color-loving yarnie. Maybe that makes me boring, but it's just the way I am. I found myself longing for a few of the colorways, and figured what the hell...I'll get some, and figure it out later. I can support my local shop, and push myself out of my comfort zone a little. It's always good to do that once in a while just to shake things up. 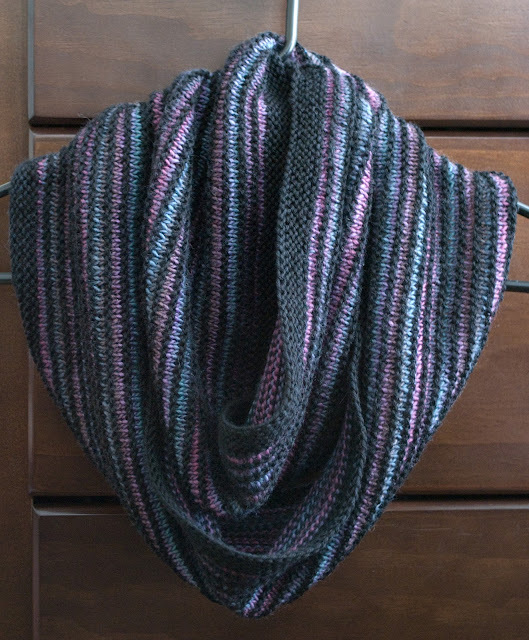 I thought I might try a Spectra scarf with one of the colorways. 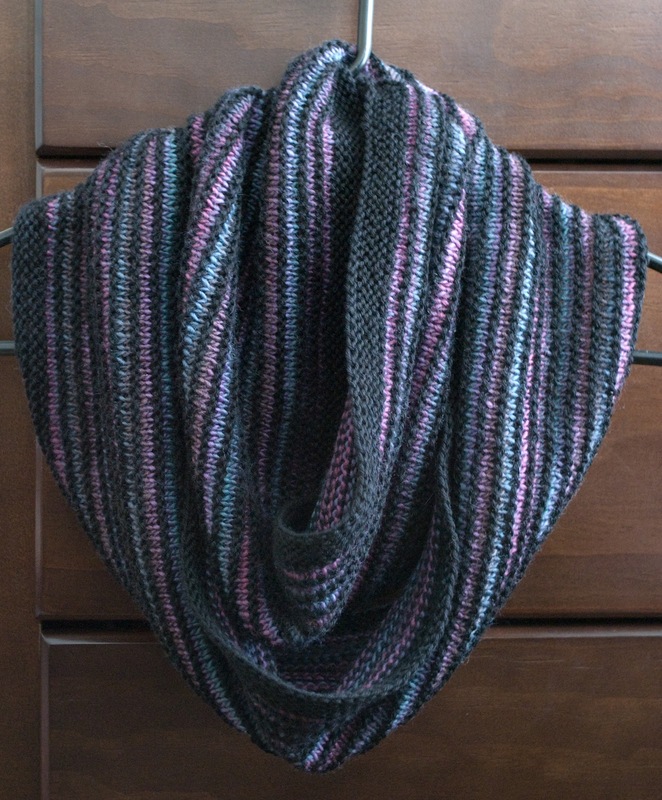 I love love love the spectra that I knit in grey and black. Woohoo!! Grey and black..what FUN COLORS....end sarcasm. Honestly though, I wore it tons last season. Maybe I could use black or grey with one of the colorways and have a really fun super colorful (by my standards anyway) scarf. I have yet to start on a second spectra, but I did come up with a little something that I really like. I wrote it up as a free pattern, and put it up on Ravelry. Here are the details. Simple stripes and wonderful texture make this a perfect accessory. This cowl is knit in the round, with two different colors for endless (stash-busting) possibilities. Note: these are real yardages used with about 10 yards added in as a buffer. When planning, it’s always best to have a little more, than not enough. Having said that, this cowl is easy to adjust if you’re running out of yarn. 19.5 stitches = 4” in stockinette on washed and blocked swatch. Now go do it... that's right, dig into the stash and cast on yet another project. Another gorgeous pattern Liz! Did you use the mini-Mochi for this? Your Ravelry link isn't working. I found it but you might want to fix it for other readers. Thanks!! Yes I used 1 ball of Mimi Mochi for it. Thanks so much for the heads up on the link. I fixed it.